I do wish they hadn't started with the paper towels. I was at an "Eco Party" put on by a local do-greener organization, the Northwest Earth Institute. We had printed out checklists about our green habits. The first few questions were making me feel warm and accomplished: Do you have a reusable shopping bag? (Yes! A good dozen of 'em!) Is it with you when you need it? (Yes! I even made a bag that holds other bags. From an old shirt and tie that I bought at the Goodwill Outlet. You can't get much more reduce-reuse-recycle than that!) Which of the following have you not purchased in the past two years: paper plates, coffee filters, paper napkins, disposable cups (ooh, I'm on a roll), paper towels . . .
Eww. Right. The paper towels. For the record, I'd biked to the Eco Party, an almost-five-mile trip from my house to the lovely one in which it was held. I'd brought my own snacks, maple-syrup-sweetened hazelnut butter cookies made with nearly all-local, all-organic ingredients. My water bottle was a Sigg, filled with tap water; my coffee thermos was still half-full of Stumptown's most delicious direct-trade, single-estate coffee. I'd even brought a couple of reusable shopping bags with me, as I had to stop on the way home to buy unbleached diapers for my son. But I have a paper-towel habit that's pretty awful, and no one could really seem to get their head around why I overused so. I tried to explain about the three boys, the abundance of messes that involve pee, poop, or mud tracked in from outside, the task of cleaning the bathroom (with vinegar and water only!) in a house with three very young children and one adult child who all tend to color outside the lines. As it were. I was relieved when we got through that and started talking about some other habits. I had just that day figured out the magic of buying bulk organic peanut butter and canola oil, of bringing your own jars to the market. Mine were recycled honey jars, filled with Portland wildflower honey only a few weeks ago until that honey was baked into breads and cookies and scones and poured with abandon in tea and on bagels. 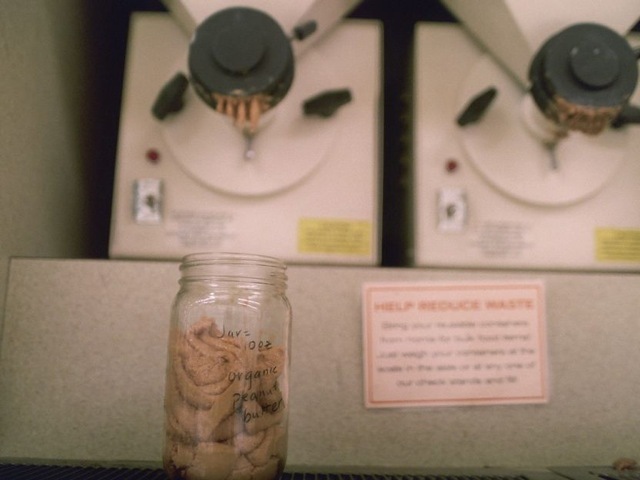 You weigh the jars before you fill them, and write the weight on them with a little wax pencil there in the store. 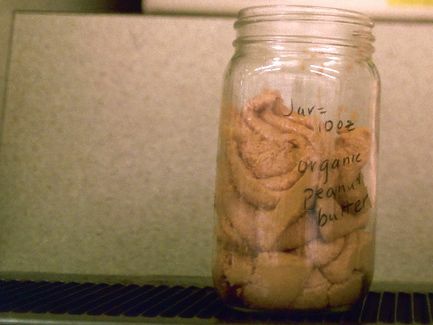 You can even bring in jars that are partially full, if you haven't quite used up your peanut butter. And can we talk about peanut butter? It's quite the topic. Hopefully I can solve all your green problems right here and now, and maybe that will be my absolution from paper-towel sins. It turns out that conventionally grown peanuts are truly awful for you; pesticides tend to concentrate in seeds (please don't get me started on cottonseed oil, as you may as well just put a couple of teaspoonfuls of weed-be-gone in your salad dressing), and peanuts are so much cheaper to produce when grown with lots o' pesticides. And the chemistry works against peanuts in every way; pesticides end up in the soil, and peanuts grow under the soil, with highly permeable skins. The poisons just seep into the protein-packed legumes, and soon you've got a prime growing medium for a special kind of fungus that releases an aflatoxin — a dangerous carcinogen. So the peanuts that are at the center of peanut butter are highly poisonous. Then, to make peanut butter palatable to our sugar-crazed nation and to give the butter a nice spreadable texture, major manufacturers mix 'em with high-fructose corn syrup and partially hydrogenated soybean oils — and now you have the unholy trinity of everything that is wrong with our food system right in your sandwich. And there are people who dare to tell you that PB&J sandwiches are better for the planet than other kinds of sandwiches. Some local mamas and I had just finished moderating a heated debate on how hard it was for some of us to give up the Jif and Skippy and Peter Pan of our youth. It's sweet, it doesn't separate, it spreads nicely on soft white bread. There may have been an attendee or two at the Eco Party who copped to buying Jif, but I'll allow them to go public with their confessions on their own terms. I have a decidedly non-radical and deliciously sweet alternative that is good for you, and the planet, and I promise it does not taste like toe jam. Call it your atonement for decades of your worst peanut-butter transgressions. Take a spoonful of peanut butter, out of your jar that you have taken to a natural-foods grocery store or food co-op that lets you pour freshly ground organic peanut butter right into your reusable container. Take a spoonful of honey out of the glass jar you have found somehow at a farmers' market or organic food mart. I like about two parts peanut butter to one part honey, and I like my peanut butter refrigerated, but to each his own. Mix in a bowl or plate until you have a nice spreadable consistency. Make a sandwich, have a spoonful, don't worry about the planet, just save yourself. And I'll promise to work on the paper towels.